Backed with great experience, we are reckoned as one of the reputed manufacturers and exporters of Cable Float Level Switch. Our extensive range of balloon level switches is an economical, viable alternative for control in liquid levels. These level switches are well appreciated in the market for their salient features such as rugged design, excellent durability and simple construction. 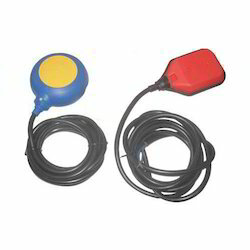 Offered Cable Type Balloon Level Switch is extensively used for measuring liquid levels. Looking for Water Level Controller with Level Switch ?